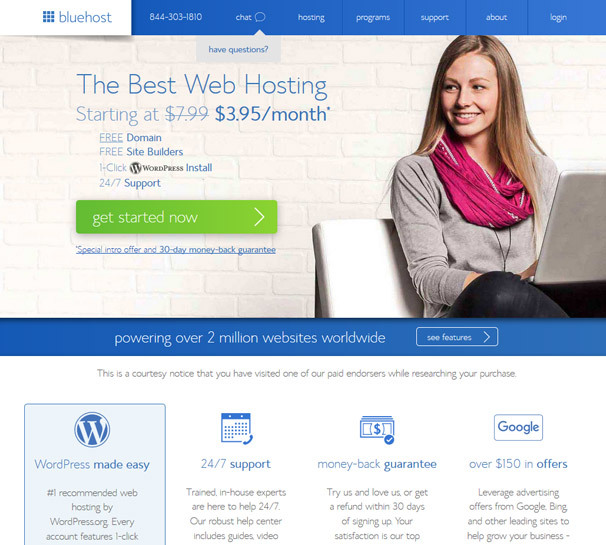 Bluehost is one of the largest companies in the web hosting industry. They’ve been a recommended host of WordPress.org’s Hosting page since 2005. They’re also one of the most recommended hosts among bloggers, but how deserved are these recommendations from top influencers? 15 Is This the Right Host for You? Bluehost was founded by Matt Heaton and Danny Ashworth in 2003. The company was founded in Provo, Utah, a hotspot for tech companies and one of the “Best Places for Business & Careers,” as stated by Forbes. The company has been a recommended host by WordPress since 2005, and it’s been supporting WordPress and the open-source community for over 10 years. It offers several different types of hosting and several different tiers per type of hosting. These types include shared hosting, managed WordPress hosting, VPS hosting and dedicated hosting. They also support other content management systems, such as Drupal and Joomla, but let’s talk about what this host offers in depth as well as who it’s for. They’re also backed by a 30-day, money-back guarantee. Let’s get into it. Bluehost offers three tiers for shared hosting as well as plans for 1 year, 2 years, 3 years and 5 years. 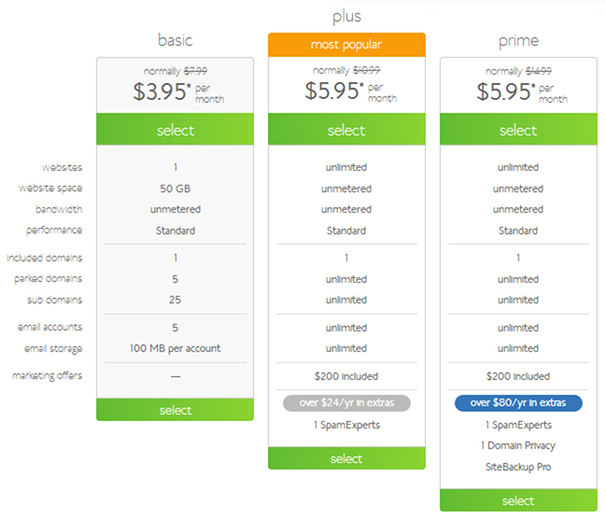 Prices can be as low as $2.75/month depending upon which tier and plan you choose. The monthly rate for the cheapest tier at 1 year is $4.95/month. You can host one website on the cheapest tiers and an unlimited number of websites on the other two tiers. The same goes for storage in that you’re allowed a maximum of 50GB of storage on the cheapest tier and unlimited amount of storage on the other two tiers. All plans include unlimited bandwidth, free SSL certificates and free, 1-year domains. You’re allowed between 5 and an unlimited number of parked domains, between 25 and an unlimited number of subdomains, and between 100MB and an unlimited amount of email storage. Bluehost’s WordPress hosting is managed and hosted on a VPS server, which means your website is still hosted in a shared environment but in its own isolated area. It offers 4 tiers that can be as low as $19.99/month when you choose the 36-month plan. The cheapest tier on a month-to-month plan costs $39.99/month. Bluehost is transparent about how much traffic each tier can handle. They range from 100 million visits per month to an unlimited number of visits per month. This is handled by between 30GB and 240GB of storage and between 2GB and 8GB of RAM. All plans come with one domain and one IP address. They also come with CDN and security services from Bluehost’s partnership with SiteLock. You’ll receive different levels of SSL certificates depending on which tier you choose. WooCommerce is also offered as a separate type of hosting from Bluehost. It has three tiers, and the cheapest tier goes as low as $6.95/month if you choose the 36-month plan. The 1-year plan costs $14.95/month. There are also plenty of issues and questions you’re probably able to find the answers for yourself, in which case, Bluehost has created a knowledge base filled with articles meant to tackle common issues and questions. Lastly, Bluehost has a dedicated status page you can reference should a problem occur with your website and you want to ensure it isn’t a widespread issue with Bluehost’s servers. Let’s talk about Bluehost’s best features before getting into what disadvantages it has. Bluehost is one of the most cost-effective hosts in the industry, especially when you choose their 36-month plans. There are also several additional ways you can save, such as our coupon, which gives you access to a discount as high as 65%. Learn more here. Bluehost offers multiple ways to host, which means it’s able to support a wide variety of businesses. First-time bloggers can choose shared hosting while large businesses can choose dedicated hosting. There’s something for everyone. Different types of hosting is great, but Bluehost’s tiers are what make it truly great for different types of businesses. If you’re a first-time blogger, you can choose the cheapest shared option and upgrade to a more premium one when your website needs it. The same is true for Bluehost’s other types of hosting. Bluehost is a big company, which gives it the ability to partner with a number of different services and offer a number of different extra services itself. This includes free domains, free SSL certificates, security through SiteLock, CDN services and more. Here are the cons of hosting with Bluehost, as mentioned before. Bluehost offers several different types of hosting, but its VPS and dedicated hosting only offer as many as 4 CPU cores and 16GB of RAM whereas other hosts offer servers with as much as 12 CPU cores and up to 64GB of RAM. This puts limits on how successful businesses are allowed to grow before they need to pack up and move to hosts with servers capable of powering their massively large, high-traffic websites. It also puts limits on the types of clients developers using Bluehost are able to take on. Is This the Right Host for You? Bluehost is not a host for everyone due to its server limitations. However, there are a wide variety of individuals and businesses that are suited for this type of host. This a popular host among bloggers, and its shared hosting and WordPress hosting plans are more than capable of powering even the most traffic-heavy blogs. There’s even a cheap option for first-time bloggers. This isn’t a host for enterprise businesses, but small businesses and startups, including small to medium and even some larger eCommerce sites, will find enough speed, space, reliability, and security with Bluehost. If you are looking for managed WordPress hosting for larger sites, check out our guide here. Ready to give Bluehost a try? Click the link below to save 65% on your purchase or check out our dedicated page for a Bluehost Coupon Code. Wow what a thorough review on BlueHost. Thanks for the great review. There are 1000’s of online program claiming they can help you make money online but at the end of the day they are not. Because of the increased number of online scams it is always advisable to do our own research before buying any product. Here comes the great help from your review making my job easy I will come back to your website to learn more information. Thanks again! You mentioned scalability but as I can tell this is referring to a predetermined number of hosting packets that have certain already pre defined specs. It’s true you can start from a small package and adjust as you go each time contacting support, and modifying your agreement. I have found something way better at dhosting.com they offer one package that scales automatically, and charges you for what you actually use instead of having to buy a larger packet each time your sites stops to work properly.